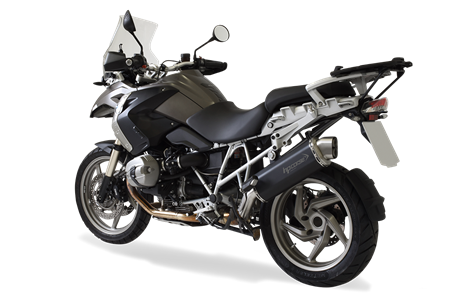 On any land, on any road, wherever you want to go, the BMW 1200 GS is the best of the companions and it is strong of its chassis, suspension and its engine can always guarantee great comfort and performance. Improved on road and off-road, the new "GS" has a powerful and reliable two-cylinder boxer engine capable of guaranteeing great driving pleasure in every situation. Just like the BMW 1200 GS, the new 4-TRACK by HP CORSE loves the adventure fully embodying the desire of evasion and the purest motorcycling spirit.Tested at the bench and in the most demanding situations, 4-TRACK guarantees reliability and gives the BMW 1200 GS slimmer rear lines that improve driveability while the powerful twin-cylinder gains in particular in the low and mid-range.